My oldest son will be starting kindergarten in the fall. He is a introverted kid. He loves to learn, takes a while to warm up to new people, and is a loyal friend. He is however at times too passive, which could make him vulnerable to bullying or more prone withdraw from activities that he would otherwise be interested in. When I envision the type of teacher that I want for my son next year and going forward in CPS, I picture a teacher that will make him feel safe, inspire him to learn, bring him joy and push his learning. I want a teacher who will teach him to take a stand, will advocate for him if needed and also will teach him how to advocate for himself. My wife and I are both CPS teachers and we know that the system of CPS is a mess, but also know that the educators who work in the buildings are amazing. As an educator in CPS for the past ten years, I have met many educators that I would love my son to have as teachers. One such educator is Sarah Chambers. Sarah, if you haven’t heard, is now in her 7th week of being suspended by CPS. She is an elementary special education teacher who has always received great ratings from her principals. She also vocally advocates for her students and special education students across the city. In addition, she also runs her schools LGBTQ club at her school. Her “crime” is holding accountable a school system in which the mayor controls schools, appoints school board members, and picks CEOs to “run” the schools without educational experience. People such as these are intimidated by vocal and outstanding educators, who call them out on their inexperience or short-comings. Sarah has been an outstanding teacher and vocal advocate for her students for many years now. I wrote about her back in 2014 as she led her elementary school to protest the ridiculous amount of testing being forced onto our students. Her school and another school boycotted an unneeded standardized Illinois test. CPS threatened to revoke the teachers’ teaching licenses if they didn’t give the test. The teachers met with parents and explained why they were against giving the tests and gained parental support for the boycott. These teachers so loved their students and were committed to doing what was right for their students that they literally put their careers on the line for their students. Her work on this protest was featured in the book More Than A Score. The actions by CPS to suspended a committed and vocal teacher are bigger than Sarah Chambers. This is how CPS has been operating for years. Once again, when you have mayoral control and people with no educational experience running schools they get scared when outstanding and vocal teachers speak up. Teachers like Xian Franzinger Barrett, Tim Meegan and other CPS teachers who have spoken up in years past quickly find their position cut. In many districts, educators would be lauded for their commitment to their students and schools, but CPS prefers its teachers quiet and complacent. The minute you are confident and vocal CPS comes for you or at least puts you on a troublemaker list. Now this year, in addition to Sarah Chambers there are 5 other teachers currently suspended for being vocal advocates for their schools and students. Teachers like Kevin Triplett, Joseph Dunlap, Laura Sierra, and Jose Contreras. Their stories and “justification” for being suspended can be found here. Now I know there may be someone somewhere thinking, “surely those teachers must have done something illegal or they wouldn’t be suspended”. If you have taught in CPS long enough you know that being vocal is a crime enough. To survive in the chaos of CPS system leadership teachers usually adopt 1 of 2 strategies. Either, 1) go along with the mess and just lay low or 2) act like you are going along with the mess and then close your classroom door and do what is best for our students. There is another option. It is the option that has the potential of incredible highs and devastating lows. This 3rd option is to teach effectively, develop critical-thinkers who question why things are they way they are and speak out against injustice. The possible high is that with a concerted and collaborated effort, over time real change will happen in CPS and the school system will improve. Mayoral control will end and school board members will be elected and no longer appointed. The low of this plan is exactly what is happening to the CTU Six, they are targeted and suspended for being too vocal. As a parent I want a teacher who not only can teach my child, but is also willing to defend my child and teach society ways to improve our schools. By suspending these 6 teachers, CPS is robbing these teachers’ students of quality instruction. The students of these teachers are and have been taught by substitutes for weeks. That is not what is best for kids. There are ways you can help. 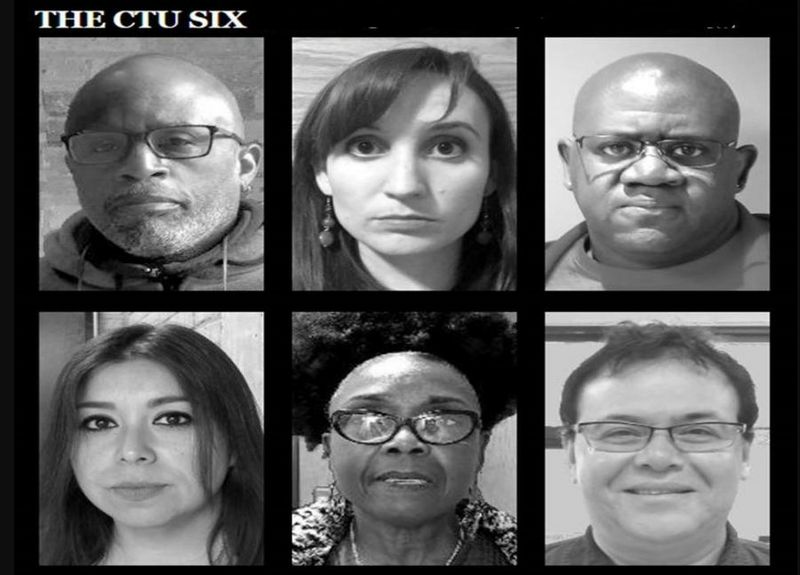 1) Contact CPS and CEO Claypool and ask them to reinstate all of the CTU Six. 2) Contact your Alderman and ask them to support the CTU Six. 11 Alderman have already publicly stated their support, shout out to Alderman Garza, Pawar, Waugespack, Cardenas, Rosa, Arena, Munoz, Mell, Lopez, Cappleman, and Reilley. 3) Get involved in your neighborhood schools, teachers need support. To view this piece on Huff Post click here. To view this piece on Alternet click here.